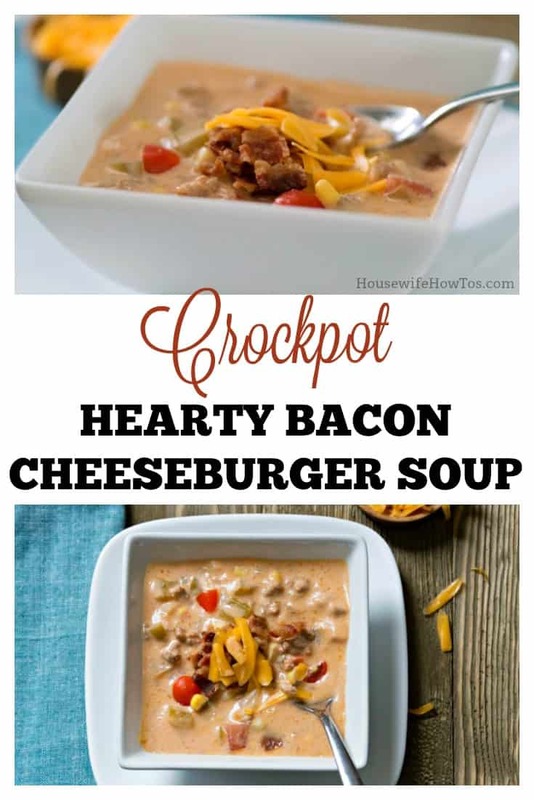 This Crockpot Bacon Cheeseburger Soup is a perfect Game Day dinner — and there are no fake ingredients involved! 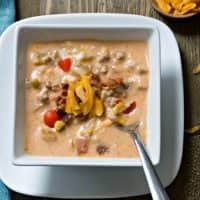 Start it in the morning, watch your team win, then come home to a creamy, cheesy, rich soup studded with kernels of sweet corn, bits of onion and celery, and juicy bites of tomato. Oh, and did I mention there’s beef and smoky bacon in every spoonful, too? 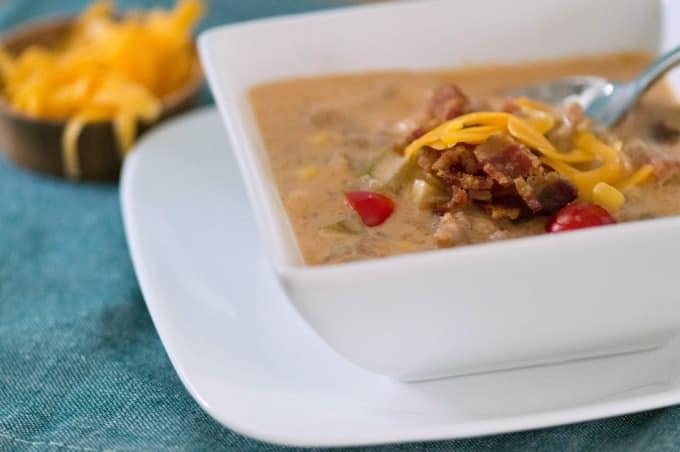 With autumn in the air, it’s time to dust off the crockpot and savor soup for dinner. I don’t know about you, but once the weather starts changing my body starts craving comfort food. This soup hits the right spot. As with all crockpot recipes using ground beef, you do need to brown the meat in a skillet before adding it to the crock. If you’re using an Instant Pot you can do it right in the insert using the saute function. Either way, be sure to drain the meat before adding the rest of the ingredients. Oh, and save your tomatoes and bacon until the final 20 minutes to keep their colors bright. 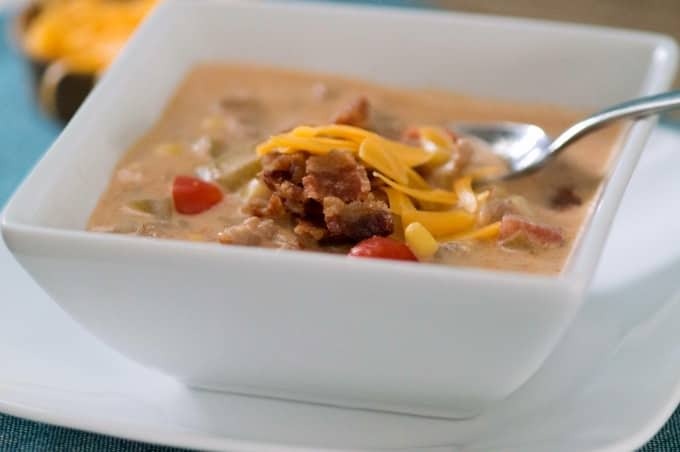 With all of the vegetables, cheese, and meat in this Hearty Crockpot Bacon Cheeseburger Soup, there’s no need for a side dish. If you’re planning ahead, though, you can’t go wrong pairing it with this Potato Bread – just set your loaf to rise when you start the crockpot and bake it while you’re putting the finishing touches on the soup. If you don’t have the greatest knife skills, or your hands hurt too much when you’re chopping vegetables, don’t worry! I use this handy chopper in just about any recipe calling for diced, sliced, or chopped vegetables. In fact, chopping vegetables is one of the first things I do when I get home from grocery shopping. It only takes 15 minutes or so to do a week’s worth but it’s one of my favorite ways to make dinner faster! Featuring REAL ingredients and big flavors, this is a perfect Game Day dinner that's sure to please your sports fans! Brown the ground beef in a large skillet until fully cooked. Drain and add to the bowl of a crockpot. To the crockpot, add (in order) the garlic powder, salt, mustard powder, Worcestershire sauce, black pepper, onion, potato, celery, corn, diced tomatoes, and beef stock. Stir well. Add the cream cheese and cook on LOW for 8 hours or HIGH for 4 hours. In the last 30 minutes, cook the bacon until crisp then drain and crumble it. Set aside 1/4 cup of the crumbled bacon for garnish. 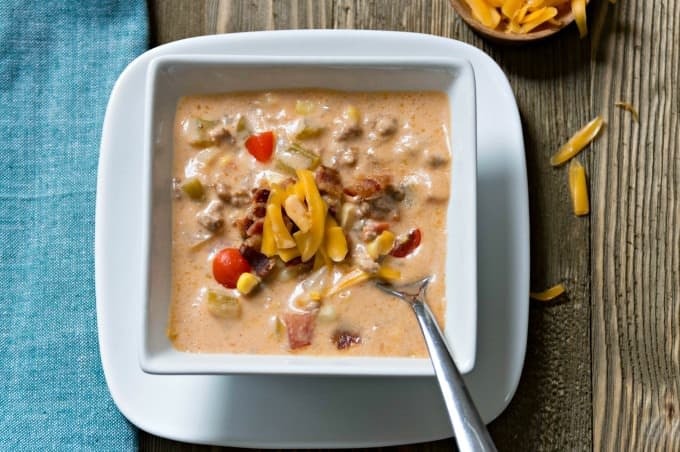 Whisk the flour into the milk and stir it, along with 2 cups of the cheddar cheese, into the crockpot. Stir in the remaining crumbled bacon and the sliced cherry tomatoes. Cook 20 minutes until thickened. Divide into bowls for serving and garnish with the reserved bacon and shredded cheddar. 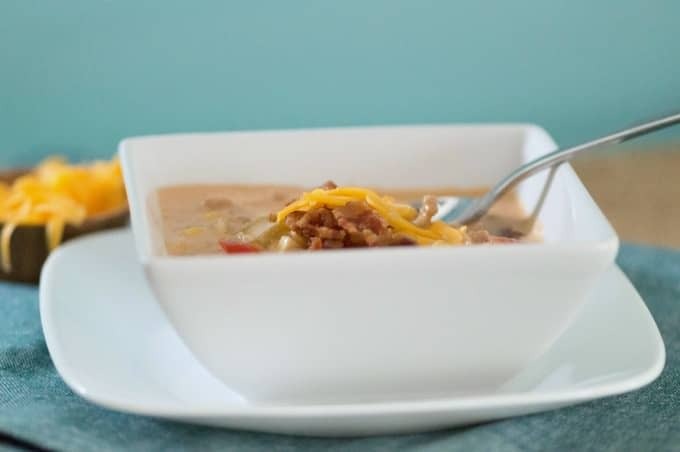 While this soup doesn’t freeze well due to the cream cheese, it does make excellent leftovers — assuming your sports fans haven’t eaten it all! Oh this sounds perfect for fall. So much goodness in here. This sounds fantastic, and, like you said, the perfect comfort food. 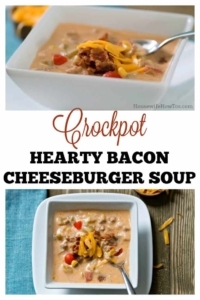 Love cheesy soup! Thanks for sharing at Sweet Inspiration!